This is a review of Sonoma Fall 2018 wax melts from Kohl's. 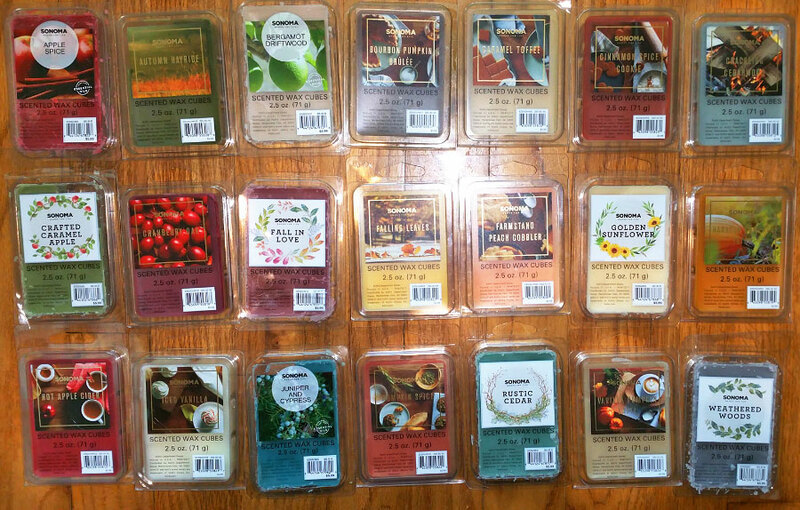 I'm underwhelmed with this year's Fall wax melts scents. Several are dupes of scents from previous years, many are "typical" fall spice pumpkiny type scents (nothing exciting), and some of the ones that are different have weak throw. A typical apple cider scent, but not as much of that harsh "mulling spices" note. So it smells more like sweet apple juice with a hint of cinnamon. It's different from the Hot Apple Cider scent; I like this scent much more, as it's more authentic. This is the same Autumn Hayride scent that came out in October 2015 and October 2016, and I'm glad they brought it back because it's fantastic, a smoky woodsy scent that smells like burning leaves. I think I do detect the cloves a little, because it's not just a smoky scent, there's something else in there. One of my favorite fall scents. Bergamot is used in cologne type scents, and that's kind of what this is, but it's also "salty", if that makes sense, and has a woodsy note with just a smidgen of smokiness. It also has a little bit of a spa or herbal quality like a tiny bit of zestiness, perhaps lemongrass way in the background. I like it. I think this is a dupe of an older scent, but I don't remember which one, maybe White Pumpkin Marshmallow from August 2017? I described it the same way back then: "This smells just like the scent name... sweet marshmallow with pumpkin spices. Very nice!" This is the same Caramel Toffee scent that came out in October 2015 and October 2016, and it's fantastic. It smells just like the notes: rich caramel, butterscotch, and cinnamon. It's a little like a cinnamon roll but without the bakery notes. A yummy rich scent of brown sugar with a bit of a raisin note, a hint of maple and cinnamon, and possibly a smidgen of nutmeg. I also smell a vanilla cookie note in the background. The scent started dissipating around 1.5 hour. I'm pretty sure this is an older marshmallow type scent. It's a sweet vanilla buttercream scent with a strong marshmallow note and a hint of caramel and maybe a smidgen of woodsiness. I do smell the sweet tobacco as well. It's very nice. I don't think it's the same as Toasted Marshmallow from August 2017, as that had a milky note with a hint of smokiness. But it might be the same scent as Fireside Memories (also August 2017), which smelled like marshmallow with a hint of caramel and a smidgen of barely noticeable smokiness (even though the scent notes were different). A very nice sweet caramel apple scent. I definitely smell the apple, so it's not all caramel like some similar scents are. I really like this scent. I can smell the cranberry, the currant, and the woodsy note, and maybe a hint of pine. It also has a smidgen of a warm cologne note, although I don't smell that as much when melted. This is more of a Christmasy/ holiday scent than a fall scent. The scent started dissipating in under 2 hours. This smells like musty pineapple to me, but I think it's the combination of old brown apples and leaves, plus a woodsy note like cedar, and a sour note that I don't care for. This is the same scent as Fall in Love that came out in August 2015. Back then, my review was, "I smell earthy pineapple with a woodsy note and very slight sweetness. It has a slight tropical note to me." This smells like old brown apples and leaves, that typical musty fall apple scent. It's the same Falling Leaves scent that came out in August 2015 (although the notes were different then: crisp green apple, orchard pear, oakwood and harvest acorn). My review then was, "It smells to me like apples on the ground in October, at the end of the apple season, mixed with brown leaves. Almost like old apples, but not in a bad way. It smells like apple cider with a mossy note, not very sweet, and very little spice if any. Definitely a fall scent." This is the same scent as Brown Sugar Peaches that came out in August 2017. My review is the same as it was last year: "I don't smell peaches or brown sugar. It's a salty savory scent with a sage-y note and just a hint of sweetness. It smells a little like turkey stuffing! I'm not a fan." I do smell peach in this scent though, but that weird salty sage note. But most people love this scent and don't detect any stuffing notes! This is not a floral scent, and it's not sweet at all. But I like it. It's a zesty lemony spa scent with lemongrass and herbal notes. This is a clove scent with pumpkin, like pumpkin pie filling (without the pie crust) with extra cloves. And it's very sweet. I don't think I smell any woodsy notes. I like this one. A typical kind of generic apple cider scent. This one has a little bit of an apple pie note. I don't know why this is called "iced" vanilla, because it's just a vanilla buttercream scent, and there's no mint in it (or even in the scent notes). It smells great though, like super sweet buttercream, or a sweet vanilla milkshake. I think there might be a barely detectable hint of cinnamon way in the background. When melted, it has a bit of a bakery note, like a vanilla cookie with a hint of cinnamon and sweet buttercream frosting. Yummy! This is the same as Silent Night from October 2016 and November 2017 (even though the scents notes are different... 2016: pine, sandalwood and musk; 2017: amber, pine, lavender and sweet sandalwood). It's a rich pine scent with a smoky background, a hint of sweetness, and a smidgen of a cologne note. Fantastic scent, and I'm glad they brought it back. A typical pumpkin pie type scent. It's one of the better pumpkin pie scents I've smelled though, without that waxy generic note that some pumpkin pie scents have. It's probably the same pumpkin spice scent that Sonoma comes out with every year. This is kind of a cologney scent (the bergamot), but it also has a little bit of a warm note with a smidgen of floral (probably the rose), and I think there's a barely detectable hint of berry way in the background. Melted, it has a bit of a sweet tobacco note. It's nice. This is the same as their Vanilla Pumpkin Latte scent from August 2017, and I'm glad they brought it back because it's one of my favorite scents. It's a fantastic super creamy coffee scent with a sweet milky vanilla note and a smidgen of pumpkin spices and maybe a hint of caramel. It's definitely a coffee scent rather than a fall or pumpkin scent. It's also similar to their Pumpkin Latte scent from August 2015, but this scent is creamier, sweeter, milkier, and with a little bit less of the coffee note. This is light on cold sniff. It smells like a perfume or men's cologne with oriental spice notes. I do detect all 3 notes, the cedar, peppery note, and a little bit of the clove. I like this one.